Gaspar Claus is a tireless explorer who ceaselessly re-configures the world map of music. 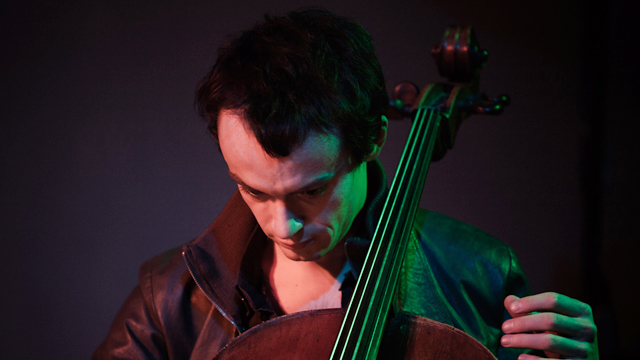 A cross-country cellist who might be described as the heretic heir of the exemplary Tom Cora, with whom he shares the blend of popular and erudite styles and a taste for melody and racket alike, along with an all-encompassing appetite, he allows his unkempt technique to serve the pure joy of being alive, ever open to surprises, with a humanist drive which contaminates his countless collaborations (from Jim O’Rourke to Sufjan Stevens and Rone to Angélique Ionatos). Improvised music (alongside Keiji Haino or Serge Teyssot-Gay), contemporary music (with Bryce Dessner), flamenco (Pedro Soler and Ines Bacan) or pop (Barbara Carlotti, Peter Von Poehl). Gaspar Claus belongs to those musicians for whom music is above all the manifestation of one’s presence to the world, and an uninterrupted celebration of obsolete and yet oh how subversive values such as frienship, the re-invention of togetherness, or the violence of pleasure. Values which he exalts with the violinists Carla Pallone and Christelle Lassort with whom he established Vacarme, a trio equally committed to play feverishly along with artists such as Rover or Stranded Horse as it is to perform untamed renditions of contemporary composers.